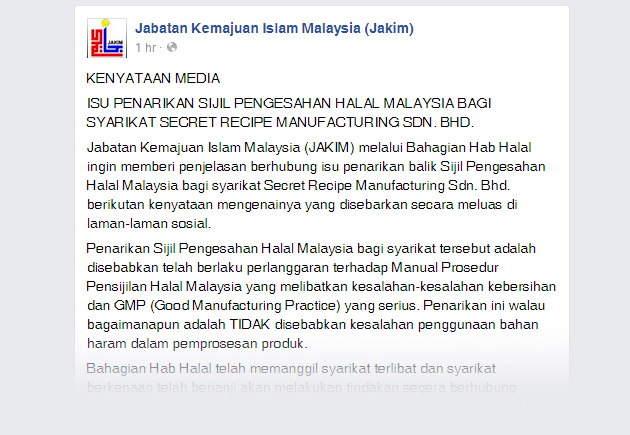 KUALA LUMPUR: The Islamic Development Department (Jakim) today withdrew halal certification from Secret Recipe Manufacturing Sdn Bhd due to violations involving hygiene offense under the Malaysian Halal Certification Procedure Manual and Good Manufacturing Practice. According to a statement posted on Jakim’s official Facebook today, its division director, Hakimah Mohd Yusoff said the withdrawal which took effect on May 7 was not due to any misuse of impermissible (haram) substances in the ingredients. Jakim's halal division, said Hakim had contacted the company in question which had given its assurance to take immediate action with regards to the offence committed. The withdrawal of the certificate dated May 7, she said did not deter the company from reapplying for a new halal certification standard. Jakim has contacted the company and it has pomised to take immediate action against offenses that attributed to the revocation. However, Jakim will conduct a thorough re-evaluation based on the inspection and compliance with the Malaysian Standard 1500: 2009 and Malaysia Halal certification procedure Manual 2014. “This is a very serious matter and will act as a reminder to halal certification holders to always comply with the standards from time to time,” said Hakimah. Meanwhile, Netizens have expressed their mixed responses on the matter since the issue has sparked concern among Malaysians, particularly the Muslim community. Until today, I had always thought JAKIM halal certification refers to the ingredient, not cleanliness. Pretty sure I'm not the only one. 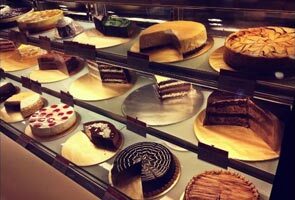 Oh Secret Recipe tidak ditanggung halal. All due to cleanliness issue. Jap. Secret recipe halal ka tidak halal?